MARK: 35 states: Touring theater, including Shakespeare, Moliere and new plays; Regional theater, including The Asolo Theater (FL), Open Stage of Harrisburg (PA), Arts Center of Coastal Carolina (SC), the Clinton Presidential Center (AR), The Classic Theatre of San Antonio (TX) and many seasons with The East Lynne Theater Company (NJ). ALISON: My favorite is the lead in Molnar’s The Guardsman at East Lynne Theater in Cape May, NJ. Also with East Lynne: George S. Kaufman’s Dulcy and The Butter and Egg Man, The Dictator, The New York Idea, and The Late Christopher Bean. New York credits include Mary of Shippensburg, The Wound of Love and Why Marry? at The Players Club. MARK: I started making my own narrative videos (writing, directing, performing, graphics) in high school, but soon fell in love with the organic symbiotic relationship between a performer and a live audience. Whether it’s getting that comedic bit to work just right (result: a big laugh) or feeling the audience intently listen and feel with your character in a dramatic moment… there’s nothing quite like it. I love doing film and TV, but playing to a camera-lens and tech crew just isn’t the same. MARK: I play Alfred Lunt, half of the greatest married theater duo of the 20th Century, as well as additional cameo-characters, which include Noel Coward, Laurence Olivier and Marlon Brando… great fun to play! ALISON: I play Lynn Fontanne, one of the most famous leading ladies of the theater in the 20th Century. 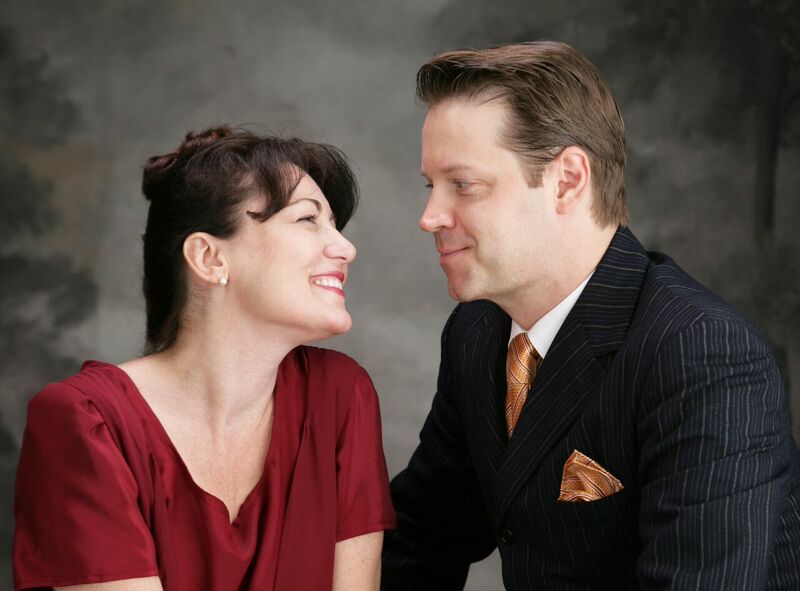 ALISON: It’s a play about the journey of two married actors: their ups and downs personally and professionally; and also a love letter to relationships and the theater. MARK: I wrote this piece for my wife Alison J. Murphy and myself, following many years of research (including a trip to Ten Chimneys, the Lunts’ Wisconsin summer home) and re-writes. A Broadway theater was named after them… a VERY rare honor, but the Lunts made only one film, back in 1931, an adaptation of their stage comedy hit, The Guardsman, and then decided it wasn’t for them. That decision, in a way, robbed them of their immortality… this play seeks to remedy that by telling their story. We cover their lives and careers from the 1920s through 1958, in a fun, fast-moving format that will appeal to theater lovers of all ages and interests. MARK: Working with my real-life wife as a historical husband-and-wife team, at all different stages in their lives, is a very rich experience. We have our history as a couple (fifteen years together), as well as a wonderful regional theater production of the Lunts’ signature play, The Guardsman, a play in which both of the characters are also married actors, so there are a lot of layers there. We also play short scenes from Lunt productions such as The Guardsman and a fight-filled rehearsal of their Taming of the Shrew, which inspired Cole Porter’s musical Kiss Me Kate. ALISON: It’s a dream that has become actualized, for me and my husband Mark. It’s an extraordinary privilege to play this character… an amazing amount of joy. Being married actors ourselves, it’s both fun and a challenge to portray this married actor couple. ALISON: I love historical dramas, musicals, comedy, Shakespeare… the whole gamut. I am inspired by observing toddlers and animals, because it’s pure behavior with no filter. MARK: I always have preferred plays to musicals, as an audience and as a performer (since I have no musical talent). The energy of being in a big room of people sharing an extraordinary performance… nothing like it. Historically, I have been inspired by those hybrid actors who also directed, on stage and film: Chaplin, Welles, Olivier. There are also productions and live performances that I will always remember: James Earl Jones in Fences, the gorgeous original New York production of Les Liaisons Dangereuses, Patrick Stewart as Prospero in The Tempest in Central Park, etc. ALISON: The one that I’m in now; it’s a peach! MARK: I’ve done a lot of them, including both leads (Jack and Algernon) in different regional theater productions of The Importance of Being Earnest. More Shakespeare would be awesome, such as another shot at Prospero in The Tempest or the lead in Macbeth. ALISON: Anything from Evita or Jesus Christ Superstar. ALISON: Emma Thompson, Mark Rylance and Brian Cranston. MARK: I’d love to get into some quality film and TV work. I respect folks like George Clooney and Tom Hanks, as gifted and versatile performers with integrity who have the great good luck to be able to initiate their own projects. ALISON: Seeing The Lunts in the original New York production of The Guardsman in 1924, because my husband and I played those roles together a few years ago. MARK: I’d love to go way way back and see Shakespeare’s “Hamlet” at the original Globe Theater in London… I’m sure it was a colorful scene, and that the language sounded very different back then, but… as a Shakespeare buff (I did three tours with the National Shakespeare Company back in the day), how could you pass that up? ALISON: The Curious Incident on Broadway. MARK: Two words: “Star Trek.” Original Series preferred, other incarnations welcome. William Shatner as Kirk impression upon request; yellow shirt optional. ALISON: Movie night at the local theater with chocolate and popcorn. ALISON: Touring our show, like the Lunts did their shows. MARK: I have a regional theater gig in the fall. A play called Biography by S.N. Behrman (a good friend of the Lunts), with a political theme for this election year. After that, we’re looking for more bookings for our Lunt and Fontanne play, so anyone who’s interested should find out more at www.luntandfontanne.com and then shoot us an email to check our availability!